Discussion question for the day: did his lead role as Anakin Skywalker in the second and third chapters of the Star Wars prequels help or harm Hayden Christensen? I’d argue those films marred Christensen’s career, as his association with the much-disliked prequels led viewers to see him as stiff and unconvincing onscreen. A decade after he left Anakin behind, Christensen continues to seek a real niche in Hollywood, which leads him to 2015’s thriller American Heist. Frankie Kelly (Adrien Brody) emerges from prison after 10 years. He visits his estranged brother James (Christensen), a fact that doesn’t please the younger Kelly, an ex-con himself who’s worked to get himself straight during Frankie’s imprisonment. Despite festering tensions between them, James lets Frankie back into his life, and he finds himself caught up in various less than legal shenanigans. Despite misgivings – and desperate for money to open his own business – James agrees to go along with Frankie’s plans. Events develop in a problematic manner. The film’s genre isn’t exactly new, so a movie like Heist needs to find something fresh to make it work. Unfortunately, it doesn’t, as it comes packed with clichés and not much to make it stand out from the crowd. Pretty much everything about Heist feels trite. The characters come cribbed from other flicks, and they never find any way to expand beyond predictable horizons. This seems especially true for the leads. Frankie offers a standard “loose cannon”, while James delivers a bland take on the former criminal who works to go straight. I can’t find any ways that the film opens them up to make them unique; they remain one-dimensional from start to finish. None of the actors elevate the material, though I don’t think they harm it, either. While not bad, Christensen feels like a James Dean impersonator as filtered through James Franco. He gives the role a little sense of sadness but doesn’t offer much charisma or depth. As a character drama, Heist flails. As a crime thriller, Heist flops. Essentially just a conglomeration of scenes and influences from other movies, this one goes nowhere. 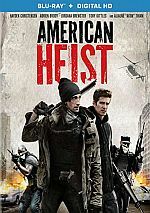 American Heist appears in an aspect ratio of approximately 2.40:1 on this Blu-ray Disc. The movie offered a satisfying transfer. Overall sharpness worked fine. A little softness affected some interiors, but those moments remained modest. Instead, most of the film seemed accurate and well-defined. I witnessed no shimmering or jaggies, and the image lacked edge haloes. Print flaws also caused no concerns. Should one expect a teal and orange palette from Heist? Yes, one should. Within those parameters, the colors appeared appropriate. Blacks seemed dark and firm, and I thought low-light shots portrayed solid delineation. This wound up as a pleasing image. As for the film’s DTS-HD MA 5.1 soundtrack, it suited the story. Much of the mix stayed with general ambience, but the elements popped to life fairly well when necessary. The occasional action/crime scenes used the channels in an effective manner and opened up the spectrum. Audio quality worked fine. Music was peppy and full, while speech appeared distinctive and concise. Effects showed accurate range and impact. Nothing here excelled, but the mix fit the film. Creating a Complex Caper: Pulling Off American Heist runs 25 minutes, 57 seconds and provides notes from producers Georgy Malkov and Tove Christensen, director Sarik Andreasyan, production designer James Gelarden, director of photography Antonio Calvache, stunt coordinator Gregg Brazzel, and actors Hayden Christensen, Adrien Brody, Tory Kittles, Aliaune “Akon” Thiam, and Jordana Brewster. The show looks at story/character areas, influences and Andreasyan’s work on the shoot, cast and performances, sets and locations, cinematography, stunts, and related topics. At nearly 26 minutes, “Caper” has the room to deliver decent depth, but it fails to do so. It mostly touts the talents of all involved, so while we get a smattering of decent details, we don’t learn a lot. The disc opens with ads for The Forger, Tracers, The Bank Job, Child 44 and Houdini. No trailer for Heist appears here. Viewers may get a sense of déjà vu as they watch American Heist. It cribs so much from other, better movies that it never develops its own identity or becomes interesting. 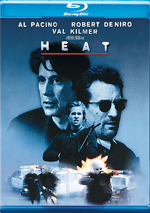 The Blu-ray offers good picture and audio along with a mediocre behind the scenes featurette. Heist turns into a slow, forgettable 95 minutes.